The first-in-the-nation plan will be phased in over three years, beginning for New Yorkers making up to $100,000 annually in the fall of 2017, increasing to $110,000 in 2018, and reaching $125,000 in 2019. If you would like to be electronically notified when you may apply for the Excelsior Scholarship, please enter your email address on the Excelsior Scholarship Alert form below. If you do not wish to register for notifications, you can check for periodic updates at HESC.ny.gov. Will I be able to attend college at SUNY or CUNY tuition free? Yes. If you are a NYS resident whose family household adjusted gross income (as filed on your 2015 federal tax returns) does not exceed $100,000 for the 2017-18 academic year and you complete 30 credits per year, you will be able to attend a SUNY or CUNY college tuition free. What does it mean to be a “NYS resident” for purposes of receiving this award? To be considered a NYS resident for purposes of receiving this award, you must have resided in the State for 12 continuous months prior to the term for which the award is being sought. How much can I receive from the Excelsior Scholarship? An Excelsior Scholarship recipient can receive up to $5,500 from the Excelsior Scholarship, minus any amounts received for TAP, Pell or other scholarships. The remainder of your tuition charge will be covered through a tuition credit paid through SUNY or CUNY. Will I be able to get an award for the fall? Yes. Eligible students will receive awards to attend a SUNY or CUNY college tuition free this fall. When will I be able to apply for the award? It is anticipated that the Excelsior Scholarship application will be available in late May/early June. How much income can my family earn to be eligible for an award? For the 2017-18 academic year, your federal household adjusted gross income can total up to $100,000 to be eligible. For 2018-19, that amount increases to $110,000, and beginning in 2019-20 and beyond, your family’s adjusted gross income can total up to $125,000. Can I get an award if I'm currently going to a public college? Yes. Students who are currently attending college are eligible to receive an award, provided they are currently on track to complete their degree on time. How long can I get the award? You are eligible to get an award for up to two years for students pursuing an associate’s degree and up to four years for students pursuing a bachelor’s degree. Students in an undergraduate program of study normally requiring five years are eligible to receive the award for five years. Do I need a certain grade point average to get or keep the award? Award recipients need to earn a passing grade to maintain their Excelsior Scholarship awards, provided they earn a total of 30 credits over the course of a year. Recipients should keep in mind that they may have other awards which also carry academic standards that differ from those required for the Excelsior Scholarship. Can I get an award if I'm a transfer student? A student who transferred between colleges is eligible for an Excelsior Scholarship if they are on track to complete on time based on the number of credits accepted by their current college. Once I receive the scholarship, is it possible to lose it? If I completed my associate’s degree, can I receive this award to get my bachelor’s degree? Yes, provided the college that you are attending accepted all of the credits you earned in completing your associate’s degree, and meet all other requirements for the Excelsior Scholarship. Are there any other requirements that I must meet after I complete my degree? Yes. You must live in New York State for the number of years equal to awards you received. 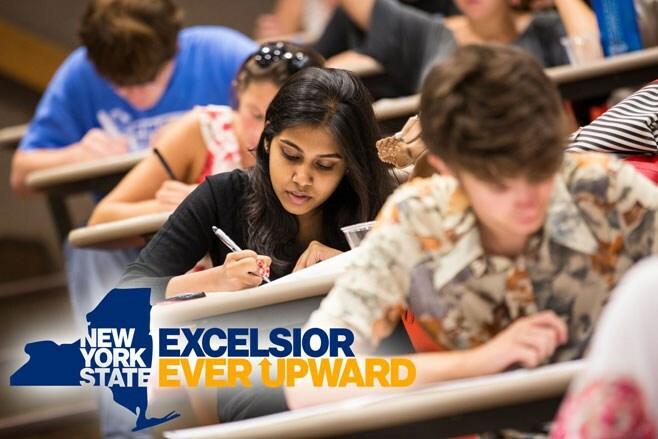 For example, if you received four Excelsior Scholarship awards while getting your bachelor’s degree, you must live in New York State for four years after college. In addition, if you are working during those years, you must work in New York State. Failure to meet these requirements will result in the conversion of your award to a loan. I already have an undergraduate degree. Can I get an Excelsior Scholarship to pursue a second degree? Applicants who have an associate’s degree are eligible to pursue a bachelor’s degree. However, you may not receive an award to pursue a second associate’s or a second bachelor’s degree. a. If you log in with your FSA ID, certain information (including your name, Social Security number, and date of birth) will be automatically loaded into your application. The IRS DRT takes you to the IRS website, where you’ll need to provide your name and other information exactly as you provided it on your tax return. Some information will be prepopulated from your FAFSA form. At the IRS site, you’ll see a page that indicates that your tax information is available. (You won’t see the actual information.) You can choose to import your information into the FAFSA form, or you can cancel your request and return to the FAFSA site. If you choose to import your information into the FAFSA form, you’ll find that on the FAFSA site, instead of your tax information being displayed, you’ll see “Transferred from the IRS” in the appropriate fields. You won’t be able to make changes to those answers. You don’t have to find your tax records. You don’t have to worry about making mistakes entering your tax information on your FAFSA® form. You may not need to provide tax transcripts if you’re selected for verification. c. Add up to 10 colleges at a time. If you have more, wait until you receive email confirmation that FAFSA is complete and then change the colleges of the list. d. After you submit the FAFSA, make sure you click “Start State Application Here” which will bring you to the TAP application. See how much federal aid you are eligible for! Special Programs for HS students!